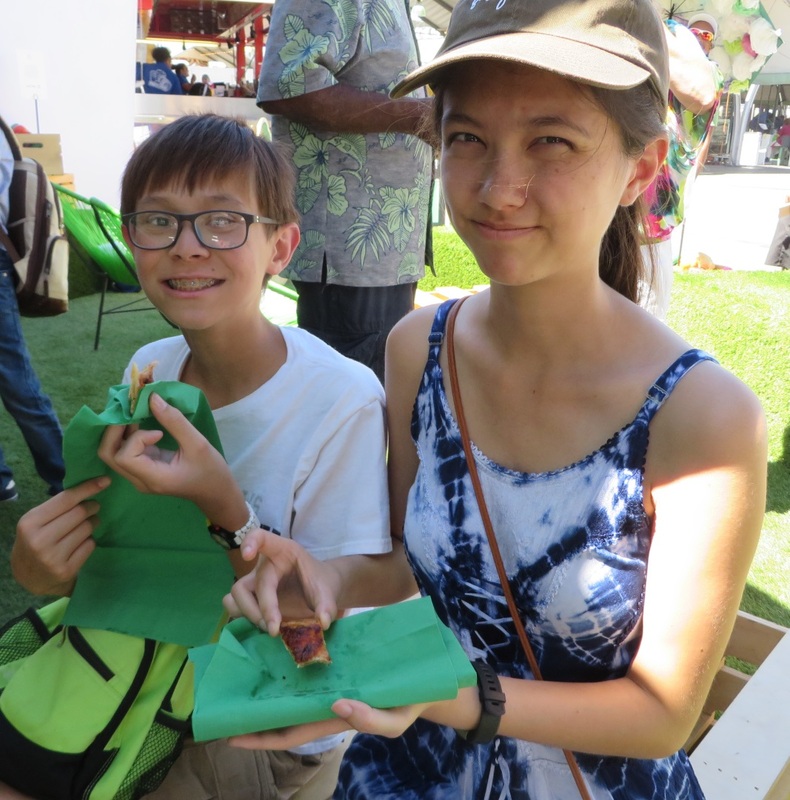 On Friday, September 14, 2018, Tim, Jeri, Lizzie, and Josiah visited the LA County Fair as part of the fair’s school program. 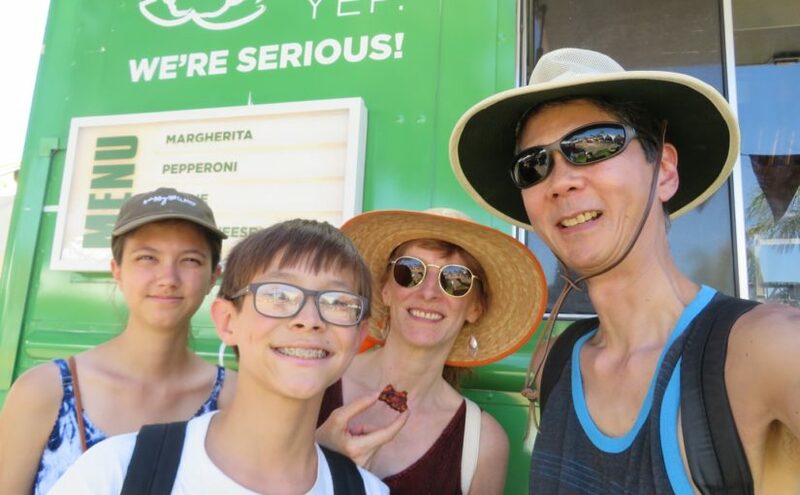 We saw a few shows, ate some food, and tried to stay cool on a very hot day. In the past, Tim has been able to drive to and from the LA County Fair without any problems. It’s about 40 miles away from Fountain Valley. This time the front, right tire of our car hit something really hard while driving in the carpool lane. It was so hard that Tim thought for sure that we popped the tire. So we navigated off the next exit and inspected the tire. Since all of the tires looked fine, we continue driving. However because (unknowingly) Tim missed getting out of the carpool lane in order to change freeways, we started heading the wrong way. Eventually we get to the fair a bit later than expected. 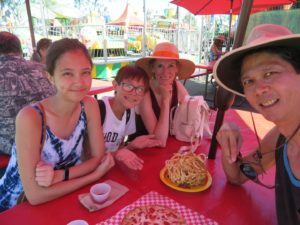 We arrive at the fair and park. By now we’re starving so our first goal is to find food. 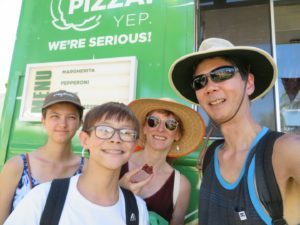 Last year at the fair, we really enjoyed eating (both lunch and supper) at a vegan food truck. We were hoping (expecting) to find it again but, alas, we were extremely disappointed. 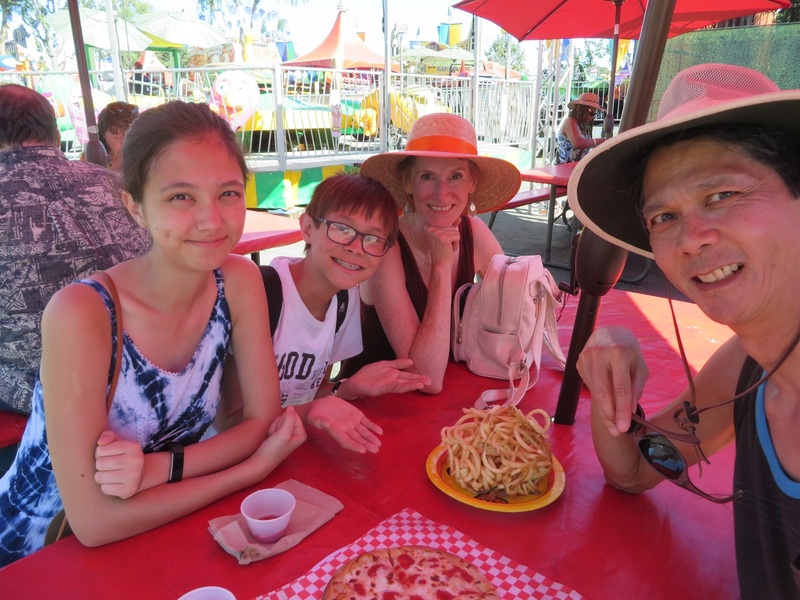 Only after touring the fairgrounds in sunny, 90+ F degree weather did we realize that we needed to find food elsewhere. One manufacturer of cauliflower-crust pizza was giving away free samples. We were so hungry that we gobbled them right up! The good news is that they were delicious! The bad news is that the samples were extremely small. Lizzie, Josiah, Jeri, and Tim getting free pizza samples. Click photo for full size. 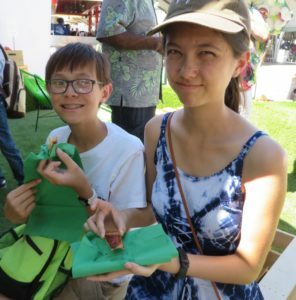 Josiah and Lizzie with their cauliflower pizza sample. Click photo for full size. We decided to get one personal-size, cheese pizza and a basket of fries for lunch. The pizza and fries were each $12. So we ended up spending $6 a person for each of us to get one slice of pizza and a good amount of fries. 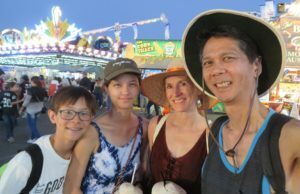 We didn’t complain since we knew that fair food is always pricey. Lizzie, Josiah, Jeri, and Tim having lunch. Click photo for full size. 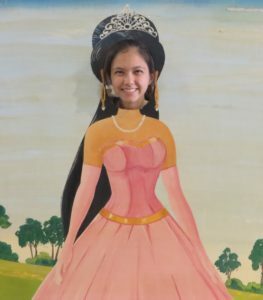 Lizzie the Princess. Click photo for full size. Josiah the Knight. Click photo for full size. Josiah loves sword fighting. Here he battles Tim. 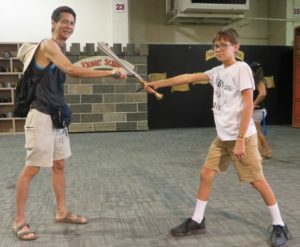 Tim and Josiah sword fighting. Click photo for full size. 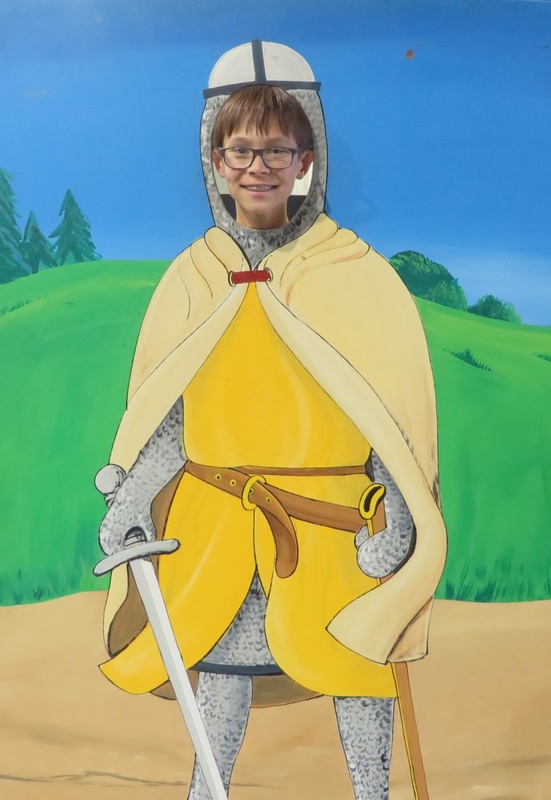 Josiah received training in how to be a valiant knight. The two knight put on a fight as well as a class for the kids. Here’s Josiah afterwards. 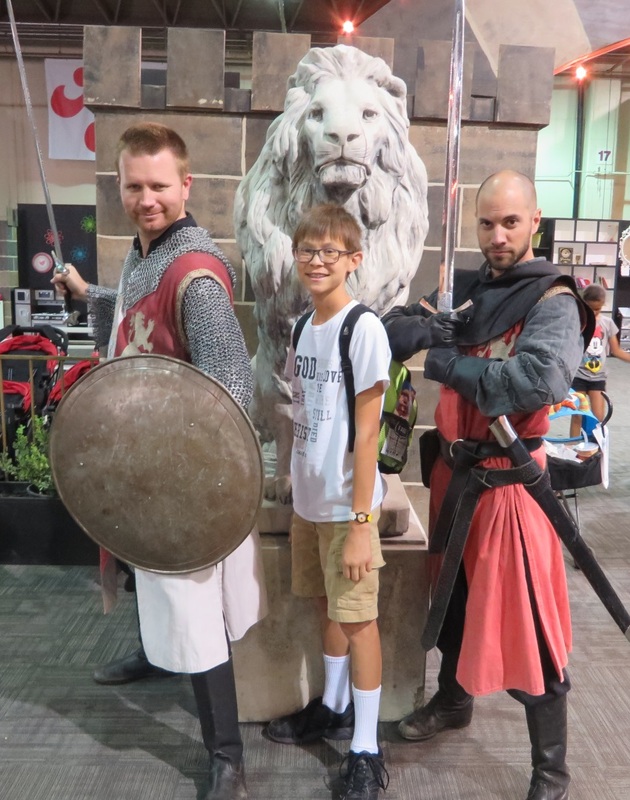 Josiah between the two knights. Click photo for full size. We saw the Peking Acrobats again this year. Each year they change up their routines. The guy on the right just scooted through the tube, feet first, while bent over at the waist. 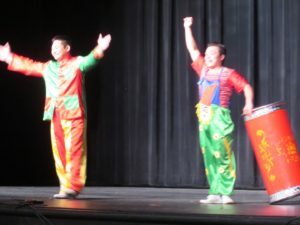 Two members of the Peking Acrobats. Click photo for full size. 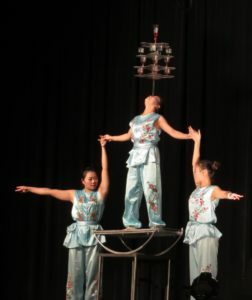 The lady in the middle first balances a small tray on a rod on the bridge of her nose. Then they add four cups. Then they add another tray. They repeat this twice more until finally they add one last glass on top. But that’s not all. Now she climbs up onto a rocking platform and then walks up two ladders attached to each side (seen in the video at the bottom). 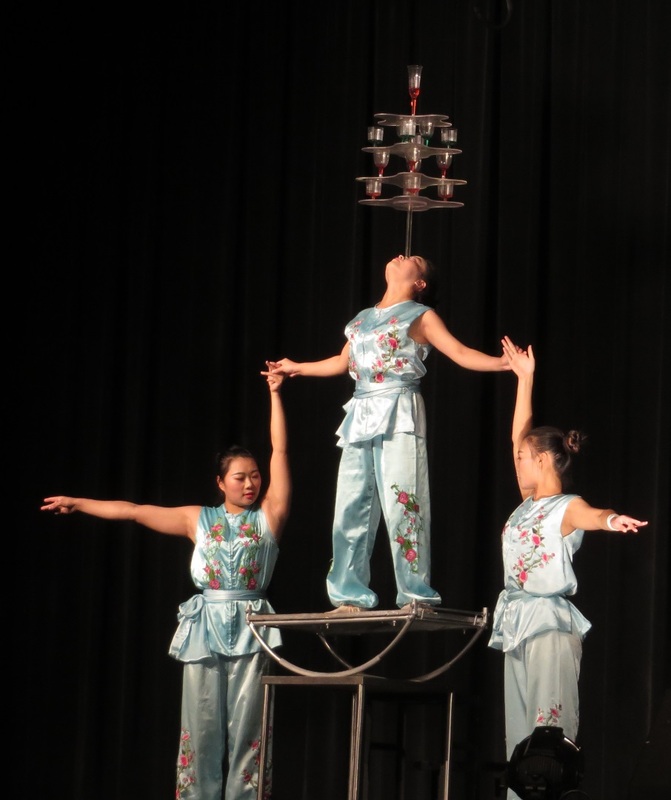 Extreme Balancing by the Peking Acrobats. Click photo for full size. We saw an outdoor acrobat show where girls performed rope routines as well as swung from a trapeze. The guy did some magic tricks including one where we had six members of the audience each pick a number from 1 to 50. After writing all of the numbers down on a large sheet of paper. He pulls out a “Pick Six” lottery ticket that he purchased earlier. He has a member of the audience come up and read the date and the price of the ticket. 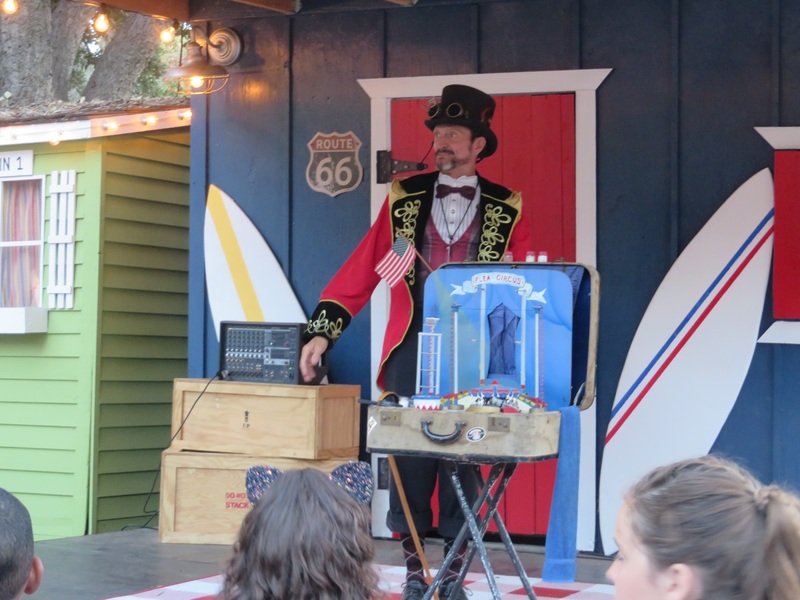 Then he reads the six numbers…which, of course, exactly match the six numbers chosen by the audience! Tim, Josiah, Jeri, and Lizzie watching Big Daddy Swing’s High Flyin’ Beach Party. Click photo for full size. Josiah with the performers with Big Daddy Swing’s High Flyin’ Beach Party. Click photo for full size. Tim and Josiah saw the “Flea” Circus. The guy was pretty funny. The Flea Circus show. Click photo for full size. After the sun went down, we enjoyed not being in the burning sun. 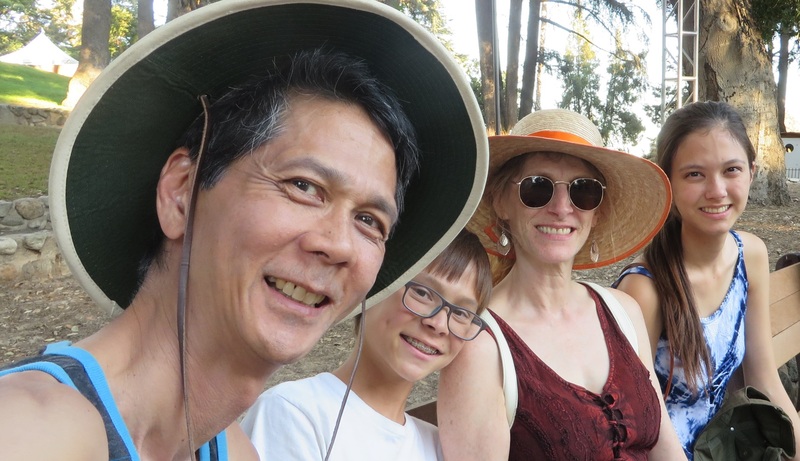 Josiah, Lizzie, Jeri, and Tim enjoying the cooler evening temperatures. Click photo for full size. For supper, we considered getting some veggie dogs. 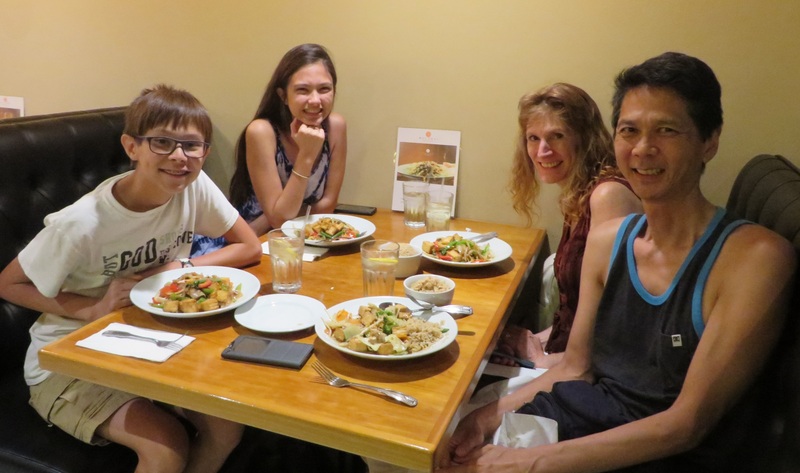 But instead, we decided to drive back and eat at a Thai restaurant near our house. The food was delicious (as expected)! Josiah, Lizzie, Jeri, and Tim having supper at Mai Thai restaurant after the fair. Click photo for full size. Here’s a digest of the day.